You may have noticed some changes around here. A new address and office, for instance? A third attorney, perhaps? Maybe a relaunched website? (You’re on it, so I hope you noticed it.) Every business eventually fills the confines of its current space and structure and big, bold moves are necessary to ascend beyond that plateau. G & G Law just made those moves, and they wouldn’t have been possible without the backing of our clients and comrades. 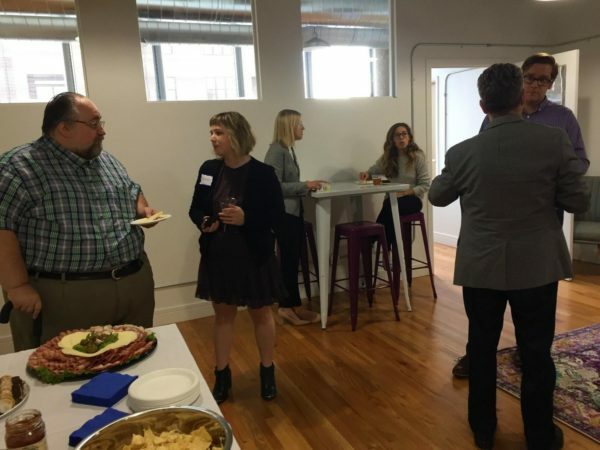 To christen our new incarnation and thank everyone who’s helped us along the way, we hosted a soiree to welcome folks into our new home and see what you helped build. Most of our services are conducted via email or phone, so it’s the rare occasion when we get to actually meet the people with whom we work. This was was a prime opportunity to hear the voice behind the text we read. I had no clue some of you had such superlative senses of style! 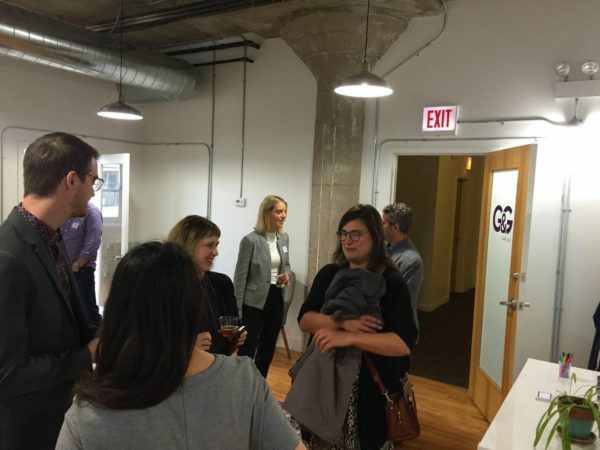 One of the joys of my position at G & G Law is interacting with people from all sorts of backgrounds. I get to hear stories from realms of real estate, culinary kingdoms, photographic fiefdoms, the lands of legal, to name a few. 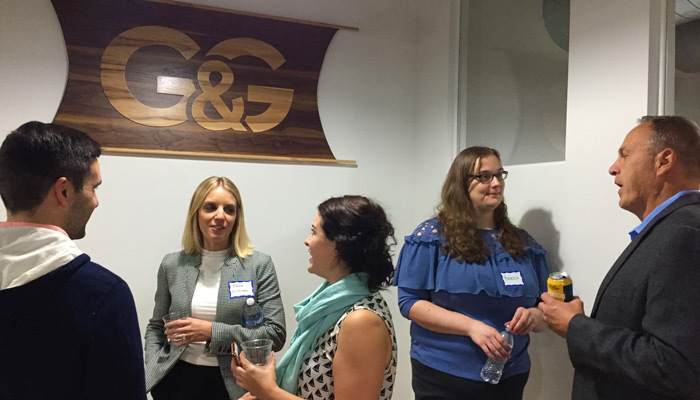 Just at this event, we had web designers, bookkeepers, stylists, creative consultants, event planners, leadership consultants, accountants, attorneys, ed-tech founders, boutique owners, therapists, authors, artisan makers, educators, and so many more! It was wonderful having people from all our communities in one place. All the food was locally sourced. 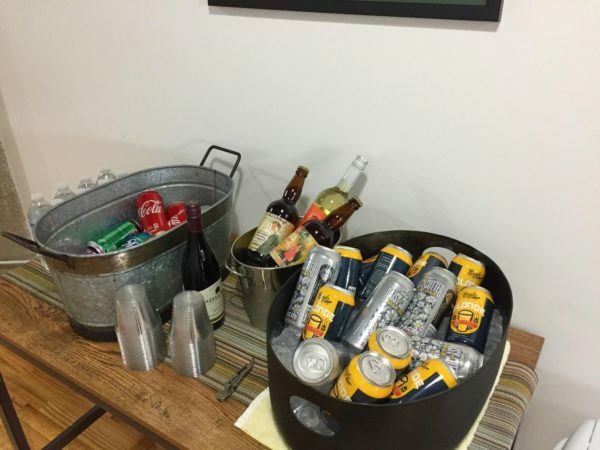 We could have reserved a fancy-pants caterer and splurged on voluptuous vouls-a-vonts and vats of vintage vino, but we’re your friendly neighborhood law firm! We practice what we preach! (Plus, as the one responsible for this whole shebang, it made errands so much simpler). Life is short, so eat dessert first, am I right? 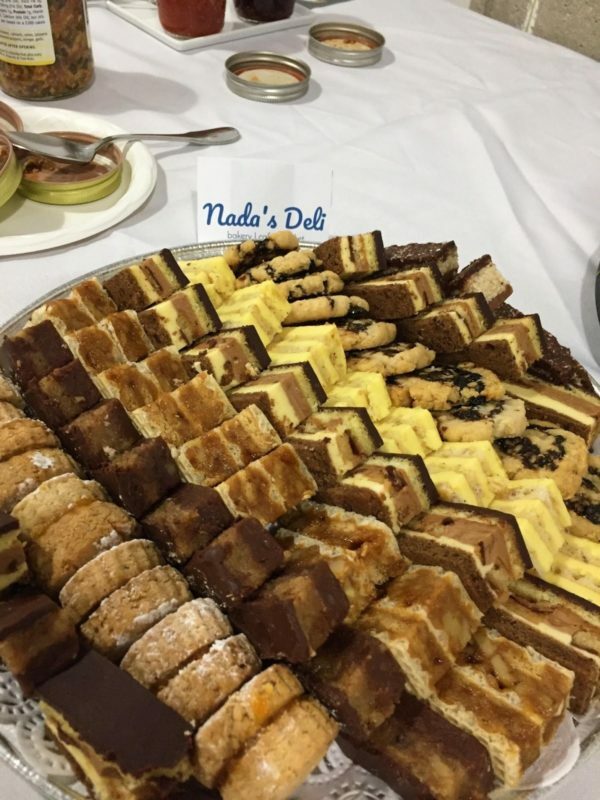 We procured a delectable selection of sweets from Nada’s Deli and Bakery. 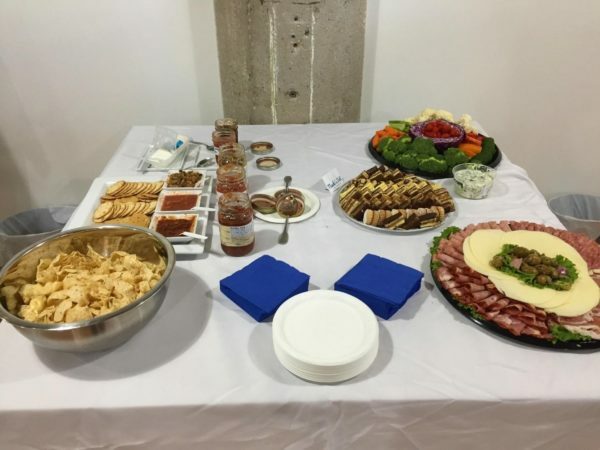 We helped Mariya and Branko purchase their business a couple years ago, and we were proud to feature a taste of their offerings. This wasn’t your run-of-the-mill cookie platter – these baked bites are Balkan! There were plum pinwheels, walnut-honey-wafer cookies, and an absolutely divine nutty, chocolatey bar that just melts on your tongue. They couldn’t have been nicer, going so far as to deliver them all the way from their bakery in Harwood Heights. 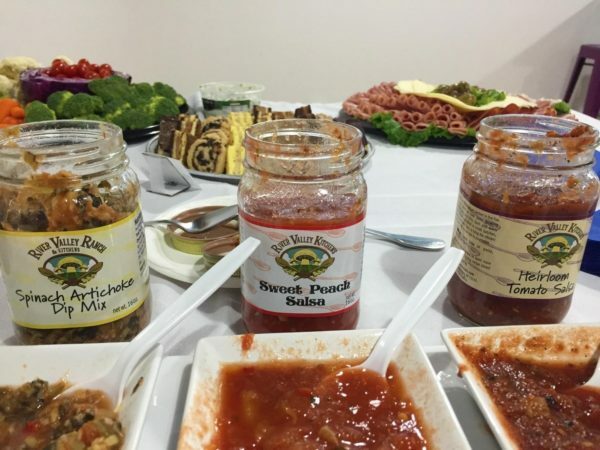 For palates preferring savory over sweet, these scrumptious salsas from River Valley Ranch, a farm-to-table restaurant a stone’s throw from our office, were a perfect addition to the table. In addition to a delicious, down-to-earth café, they feature all sorts of goodies from their Wisconsin farm in an attached grocery. We also got our hands on some very special jams from Mad Unicorn Eats, a brand new business churning out a wide selection of spreads. We set out the Spicy Chili and Pineapple Upside-Down Cake jams with some goat cheese and crispy crackers, to a ravenous reception! Food, food everywhere, nor any drop to drink? Not on our watch! Local suds from hometown favorites Begyle, Half Acre, and Band of Bohemia washed down our variety of victuals. None of them traveled more than two miles to our office, meaning the brews maintained peak bubbliness – one of the many upsides of working on Malt Row. All told, the event was a success! Huzzah! We extend our heartfelt gratitude to everyone who attended, and to you all for your ongoing support. We wouldn’t be here without you and we’re excited to keep building lasting relationships (reach out here!). Thank you for being the best part of G & G Law.